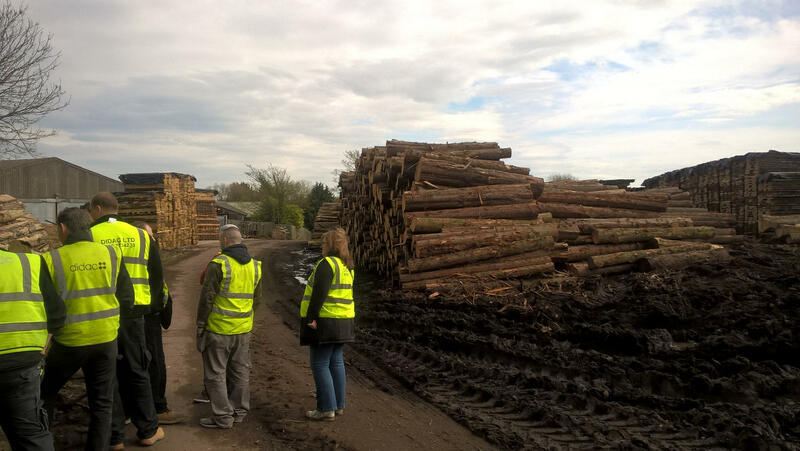 On the 30th March 2017, Didac staff and learners visited Vastern Timber, in Wootton Bassett, Wiltshire. The tour, allowed all to see their locally sourced tree, through to conversion, kiln drying and final machining processes. Vastern Timber is one of the largest British hardwood sawmills in the country, specialising in cutting and manufacturing native grown timbers including English oak, sweet chestnut, ash, sycamore and larch. A family business, it is owned and run by three members of the Barnes family: Peter, Jon and Tom, who represent the third and fourth generations of family working in the company. Founded in High Wycombe in 1904 by Leonard Barnes as Barnes Branch & Co, the company began life as a furniture manufacturer, specialising in the production of traditional beech furniture. Over time the factory gradually evolved into a producer of components servicing other local makers. Barnes Branch & Co was particularly well known for its beech and ash ‘Windsor back bends’ which gave the traditional Windsor chair its distinctive shape. During the Second World War the factory was commandeered to produce wings for the mosquito aircraft. Increasing demand for timber products led to the acquisition of the Vastern Timber Sawmill in Wootton Bassett in 1974 and a second sawmill at Studley, near Chippenham, in 1982. In 2014 Vastern Timber continues to trade from two sites in Wiltshire where they have four log-converting bandmills, computer-controlled drying kilns and well-equipped machining facilities, enabling them to process both hardwoods and softwoods for a wide range of uses. Cutting and processing their own logs allows them to offer a range of species, grades and specifications that are not widely available from other merchants and having large stocks ensures that they can offer short lead times and the security of knowing that they will not run out. Working closely with architects, builders, joiners, furniture makers and timber framers, they provide a professional yet personal service tailored to the unique needs and wishes of their clients. Their knowledge, expertise and attention to detail ensure that client experience with Vastern Timber will be an efficient and hassle-free experience.